Who you gonna call? Firefighters! On Wednesday, a group of police officers got stuck in an elevator inside a Kansas City, Missouri, police academy. It has been reported that the elevator stalled due to being over the weight limit, and the academy staff had no choice but to call Kansas City Fire Department for help. 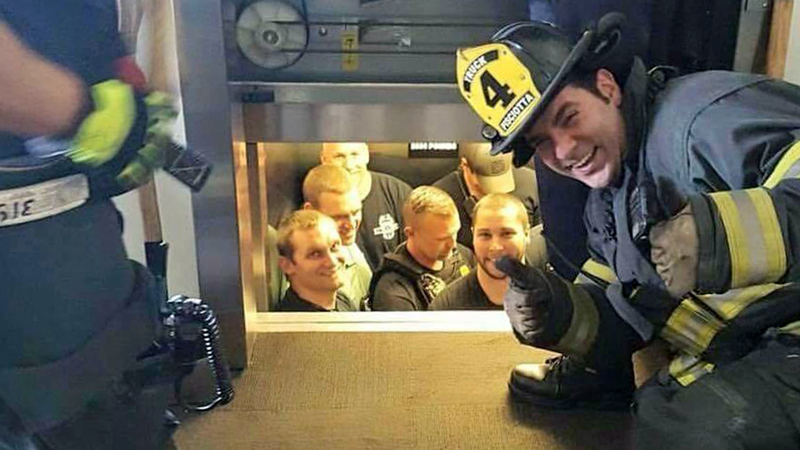 A team of firefighters came to the rescue, but they couldn’t resist snapping a hilarious photo first. In addition to that, Gregg Favre – the Kansas City Fire Department Chief – posted the snapshot of a smiling firefighter giving a thumbs-up in front of an elevator full of cops to Twitter. The image has also been posted to the Kansas City Police Department’s Facebook page, with the caption: “Well, that was embarrassing.” The post garnered more than 9,000 likes and has been shared over 4,000 times. Lesson of the day for the police officers: don’t exceed the elevator’s weight limit!